Last Week in Review: Volatility continued in the markets, helping home loan rates reach 18-month lows. Forecast for the Week: More volatility is likely ahead, plus key reports on housing and inflation. View: Adopt these three easy habits to maximize your productivity. "I don't know why I go to extremes." Billy Joel. It's been a week of extreme volatility in the markets, though the reasons for this are pretty clear. Read on for details, and what they mean for home loan rates. The sell-off in Stocks continued in the latest week, pushing Mortgage Bonds considerably higher—and helping home loan rates reach 18-month lows. There are several reasons investors have moved into the safe haven of the Bond markets, including economic and geopolitical concerns abroad, rising Ebola fears, and weak economic data here at home. For example, manufacturing in the New York region plunged in October to its lowest level in six months, while Retail Sales in September were dismal, showing an ease in most consumer spending sectors. Another major reason Stocks have worsened lately is the upcoming end of the Fed's Bond-buying program. Stocks performed terribly after the first and second rounds of the Fed's Bond-buying program ended, and that pattern seems to be occurring again. This is a key factor that could impact the markets—and home loan rates—in the weeks and months to come. 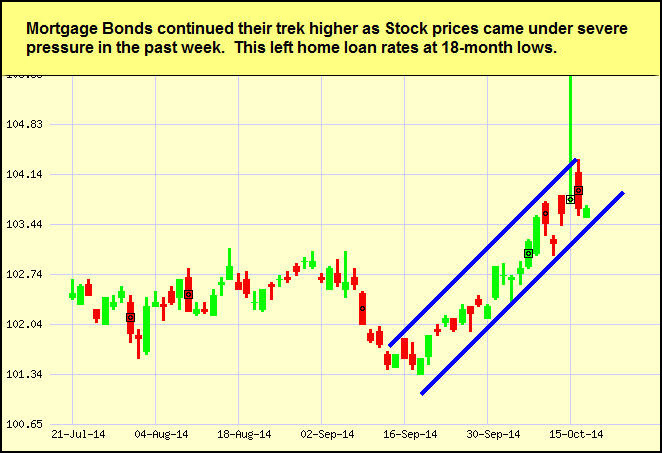 If Stocks continue to worsen, Mortgage Bonds and home loan rates could continue to improve. Of note in the housing sector, September Housing Starts rose by 6.3 percent from August. However, the gains were led by an 18.5 percent increase in apartment starts, while single family dwellings were up just 1.1 percent. Building Permits, a sign of future construction, came in just below expectations. While these were okay readings, the National Association of Home Builders Housing Market Index was a big disappointment in October, falling five points after consecutive gains in the previous four months. The three main components of the index (which include current sales conditions, expectations for future sales, and a gauge to traffic prospective buyers) all declined. This week's economic calendar is on the light side, with housing data the highlight. 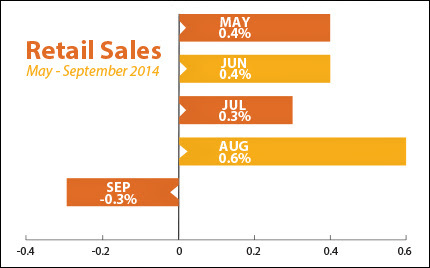 On Tuesday, look for September's Existing Home Sales. New Home Sales for September follow on Friday. On Wednesday, we'll get a read on inflation at the consumer level via the Consumer Price Index. As usual, Thursday brings Weekly Initial Jobless Claims. Last week's reading hit a 14-year low. Remember: Weak economic news normally causes money to flow out of Stocks and into Bonds, helping Bonds and home loan rates improve, while strong economic news normally has the opposite result. The chart below shows Mortgage Backed Securities (MBS), which are the type of Bond on which home loan rates are based. When you see these Bond prices moving higher, it means home loan rates are improving—and when they are moving lower, home loan rates are getting worse. To go one step further—a red "candle" means that MBS worsened during the day, while a green "candle" means MBS improved during the day. Depending on how dramatic the changes were on any given day, this can cause rate changes throughout the day, as well as on the rate sheets we start with each morning. As you can see in the chart below, home loan rates continued their improving trend, helping home loan rates reach 18-month lows. I'll continue to monitor them closely. Pick three wins for the day. Decide on the top three things you want to see accomplished that day—then, text them to yourself. Even if you don't "win" every day, this ritual will help you clarify your goals faster. Block your calendar, achieve more. Take your to-do list and block off the amount of time you estimate each task will take. Then, add 33 percent. If a project is multi-day or has dependencies, break it into chunks—and allow no interruptions! Power up after lunch. Take 15 minutes after lunch to refocus: turn off your computer or sit in a conference room and review your list of three wins. This check-in will help you identify distractions and derailments, and put you back on track with the remainder of your day. As always, please feel free to pass these great productivity tips along to your team, colleagues and clients!